Life isn't easy for ancient vampires trying to blend in with regular people in a new city - and if those vampires are schoolkids? That's a whole different story. The Livingstone kids are fruit bat hybrids who have left the Old World dangers - and immortality - behind for a "normal" life in New York City. But normal doesn't necessarily mean easy, especially with lingering vampire traits complicating things. Lexie's super speed, amazing strength, and unfortunate poetry-quoting habit embarrass her in front of her classmates, and worse - her secret crush. Hudson can fly like a bat and is determined to save the planet, but with a vocabulary from the wrong century, he doesn't fit in with the other fourth-graders. Maddy has a hard time sticking to her new vegan diet, and an even harder time convincing her siblings that the new neighbors are blood-drinking (i.e., rule-breaking) vampires. In her offbeat portrayal of this not-quite-normal family, Adele Griffin uses her unique brand of humor to introduce readers to three siblings who face challenges growing up that most kids couldn't even imagine. 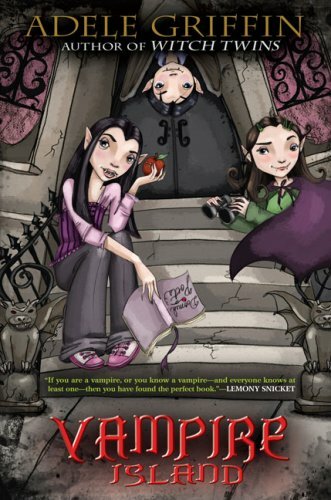 Vampire Island is a solid middle-grade vampire story. I always find middle grade books difficult to review, because they're fun to read but tend to lack the substance that gains higher ratings for books for older kids. Kids should love this book, as it contains intrigue, elements of horror, vampire weirdness, unrequited love, and strange [fruit bat/vampire hybrid] kids who don't fit in well at school. What could be a better combination, right? The ending was a little frustrating. On one hand, one of the storylines was neatly wrapped up. On the other hand, though, we learn something about one of the secondary characters that could lead into some interesting material for future books. Vampire Island is a fun, light, entertaining read for appropriately-aged kids. Junior high-aged kids and up, though, will probably find it too immature for their liking. This sounds really adorable :) I will have to keep an eye out for it. It really is! If you read it, make sure you look out for the two sequels, too: The Knaveheart's Curse and V is for... Vampire. I haven't read them yet, but they look just as cute!